When the topic of hacking is brought up, a common thought that arises is that of an action movie character sneaking into a computer database to access information. When students gather at the University of Miami this month to hack for 24 hours, however, they will not be engaging in negative mischievous tasks. Instead, they will be hacking for improvement. The fourth annual hackathon will be kicking off this year’s “Engineering Week.” U-Hack will begin at 11:30 a.m. on Feb. 21 and continue through 11:30 a.m. on Feb. 22. in the center ballroom of the Student Activities Center. The U-Hack team is made up of executive board officers from the student chapter of the Institution of Electrical and Electronics Engineers (IEEE) and, this year, it is sanctioned by Major League Hacking, the largest nonprofit hackathon that helps hackathons across the country. Senior Christian Perez, president of IEEE, explained that hackathons are “open-ended coding competitions” that allow for students to be creative in their projects. Students can either start from scratch or choose something that has been previously created to improve its functionality or purpose. At the end, the projects are demonstrated to judges who determine whether the team wins prize money or other prizes. “Participants generally focus on creating apps for mobile platforms, but the scope of the competition extends to web-development, software programs and even hardware creations,” Perez said. Judges look for creativity, technical challenge, functionality, marketability and ease of use, according to Perez. “Students not only have to worry about the technical coding challenge, but also the end-user and how one might sell the product,” he said. Under this year’s theme of “Hack for a Better U,” students will be given the task of improving a platform or device by building projects for the benefit of improving one’s lifestyle. 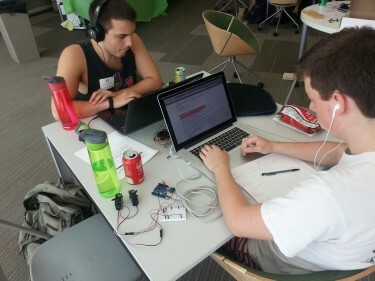 The theme allows students to use any platform, framework or hardware device they choose to make something better. “Whatever will make you or others just a little bit more efficient, healthier, or just worry a little less is what we’re hoping to see,” Perez said. U-Hack consists of mostly UM attendees, but it also attracts students from universities across the country since it is nationally sanctioned. It is open to students of all majors, and no coding or technical experience is required. “You can have the engineers work on the programming side of it, while people who are, let’s say, public relations, can figure out how to they can use social media to promote it,” said sophomore Alexander Ruhlman, who serves as chairman of U-Hack and works with a team of five other executive board members from IEEE. For those participating who want to learn but don’t have as much experience, the mentors that sponsors bring in are available to help, along with other hackers, since it is a group effort. Ruhlman explained that asking others at the event was how he was able to learn his first time. There are three main things Ruhlman wants participants to learn. Those interested in participating can visit coe.miami.edu/uhack2015/ or email um.ieee@gmail.com with questions. For more information, email Simone Douglas at s.douglas1@umiami.edu.